Stringybark was used for building shelters or willams. Bark was cut off in slabs to form the roof and walls, while acacia or similar wood formed the frame. The willam was a simple structure strategically positioned to protect against wind and rain and to maximise the heat from the campfire. 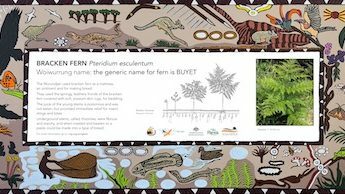 The floor was covered with bracken fern and possum skins to make it warm and comfortable. 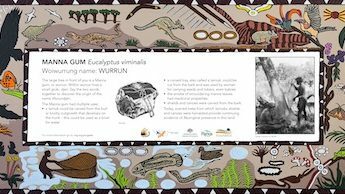 The Wurundjeri used the fibrous inner-bark to make string and rope for nets, ties and string bags. The fibres were rolled on the thigh into lengths that could then be combined to make a strong rope. Ant eggs were mixed with the dry, powdered outer bark of the Stringybark and eaten. The mix tasted like creamed butter and sugar. Commonly known as Red Gum or Red Stringybark. Many of the older stringybarks trees in this reserve have died as a result of the thirteen year drought which ended in 2009. New plants are growing in the undergrowth. USES: This tree was used as a housing material. Cut off in slabs, bark formed the roof/wall of the willam. Acacia or similar wood formed the frame. This simple structure was strategically aligned to avoid wind, rain and to maximize the heat from the camp fire. The floor was covered with bracken fern and possum skins to make it comfortable. The fibrous under bark was used to make string and rope for nets, ties and string bags. The fibres were rolled on the thigh into lengths which then would be combined to make a strong rope. Aboriginal people would gather ant eggs/pupae in a tarnuk (bucket made from the burl of a tree). 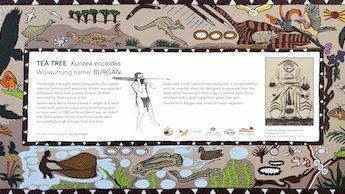 They would tear the dry outer bark off the stringybark and rub in their hands until it was powdery – this was mixed with the ant pupae/eggs. They then cupped some of the mixture in their hands and blew away the loose fibres before eating. It was said to taste like “a mixture of butter and sugar”.